Much can change in 20 years, and time isn’t always forgiving. First Wife brings about all the ugly truths that Claire & Jamie (and everyone in between) must face. It’s one hell of an emotional ride, tugging at the heartstrings every second of the way. You’ll find yourself on the edge of your seat, your face in your hands, with many heart palpitations while never wanting it to end. But wait! The episode excitement does not stop there! Laoghaire has two children who Jamie greatly cares for (but did not father). In her jealousy, a day later, Laoghaire shows up with a pistol and accidentally shoots Jamie while threatening Claire’s life. 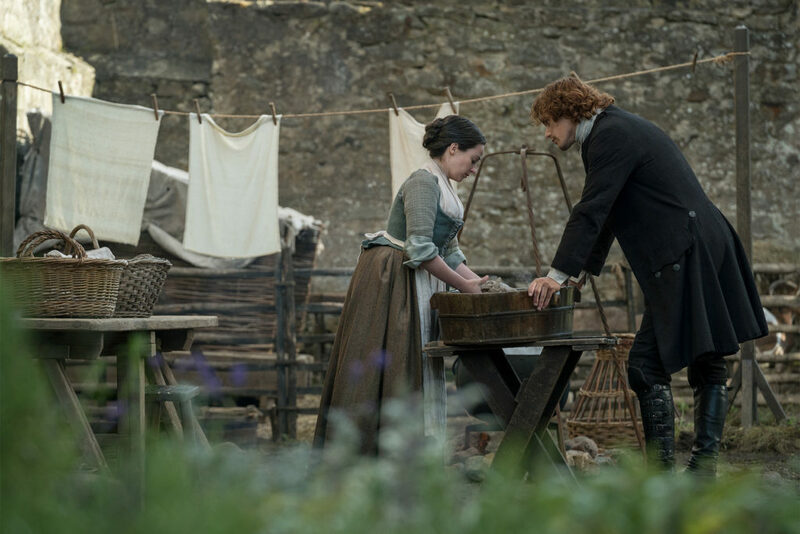 Jamie and Claire consult with Ned Gowan, who is still alive, to find out that Laoghaire and Jamie’s marriage is considered invalid by the church. All leading up to, Jamie, Young Ian and Claire visiting an island to gather a box rare coins and gems (treasure!) to trade into pounds to use for alimony; however, Young Ian is captured by what we can only guess are pirates in the process. Wow. How Is Claire Like A Mermaid? 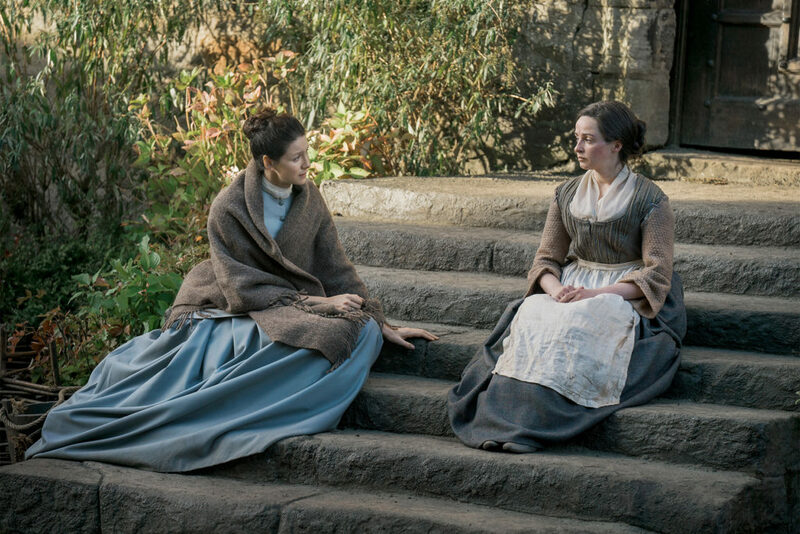 Claire isn’t handling Jenny’s cold shoulder very well and wants to tell her the full truth. Jamie’s responds by saying, “You might as well convince her you’re a mermaid.” Which actually might not be too far from folklore truth. In British folklore mermaids were considered unlucky omens, foretelling disasters. In pirate tales mermaids brought bad luck and could bewitch folk into giving up their gold. And for other cultures mermaids brought acts of kindness and would fall in love with humans. Claire’s mystical ways have her labeled the “White Witch” (aka La Dame Blanche). She’s fallen in love with a human. She’s foretold Jamie, Jenny and several others of disasters to come (and how to prevent them). Like planting potatoes to beat the famine. She’s caused Jamie, Clan MacKenzie and Clan Fraser an uncanny amount of bad luck in the process. All of the additional Black Jack Randall trouble, for example. Granted the clans had their own trouble with the redcoats long before Claire, but Claire’s arrival in the highlands definitely exacerbated the situation. And now, she’s seeking out treasure to give up! It’s hard to be Claire. There’s four people in the world that know everything she’s been through and only one of them lives in her present day 18th century. With two others dead, and one living in the 20th century. Who do you talk to about your troubles when you’re upset with the one person who truly knows you? When do you decide to let others in on the secret? How much do you reveal? Will they believe you? Do you trust them to keep your information on the down-low? In First Wife these questions are running a marathon in Claire’s mind. She needs to talk to someone when Laoghaire re-enters the picture. She wants Jenny, her sister-in-law whom she loved dearly, to be the warm welcoming friend she once was. Jenny is hurt, distrusts Claire and isn’t sure she ever wants to trust her again. This entire episode is about how the truth can hurt. It’s testing the limits of honesty and deceit. It’s so riveting that all you can do is tear-up in empathy for Claire. If you were Claire, how would you handle the situation? Would you let Jenny in on your double-life? Amongst all the questions and confusion, the new and old faces, and familiar yet unknown locations, Claire holds it together. When Laoghaire shoots Jamie, Claire puts all her anger and anxious energy aside to be Jamie’s doctor. Love conquers all, and Claire not only loves Jamie but she loves being a healer. Then the most beautiful moment of all happens. With her surgical equipment laid out, Jamie on the table and Claire hard at work, Young Ian steps into the room with a curious eye. He seems mesmerized by what Claire is able to do. Then looks down at her medical kit and comments, “Those are very fancy knives you got there, auntie.” Auntie. That’s right kids. Claire is your Auntie. She is family. She is not a ghost. She is still your Uncle’s wife. Jamie still loves her, and vice versa. And with such a simple yet reassuring word as auntie, Claire has finally found home again.